After reading former Olympic gymnastics hopeful Putignano's sinister yet intoxicating memoir of addiction, recovery, and more addiction, you wind up feeling like one of his closest friends. 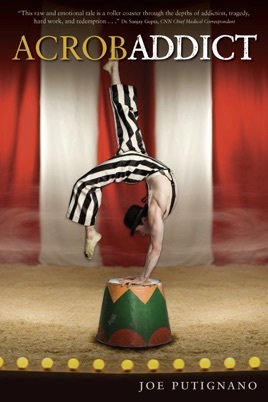 The first-time author, who now portrays Crystal Man in Cirque du Soleil's traveling production of Totem, divulges what must be nearly every significant detail of his journey from the basement of his parents' Massachusetts home, where as an 8-year-old he taught himself flips using old couch cushions; to the U.S. Olympic Training Center in Colorado Springs, where the author's insane quest for perfection exposed his insecurities and triggered his self-loathing; and finally to a seemingly never-ending series of addict escapades throughout his college and post-college years that somehow did not even climax after he was twice declared clinically dead. Putignano's homosexuality plays a crucial role in his story, and it is the one topic here he handles delicately. Elsewhere, his prose is unfiltered: graphic and intimate. Prone to hyperbole to the point of distraction, Putignano nevertheless writes so vividly about his highs that readers practically experience them with him. Similarly, his lows drop them into the private circles of hell on earth he created. A more powerful anti-drug missive would be tough to find. This book was phenomenal. I was captivated by Joe's story as he recounts his darkest days. Such an inspiration to many! Highly suggested for anyone! I found the epilogue to be the best part of the book. I wish the whole book was as insightful as that was. The entire book was about him doing drugs and it got old after awhile. Things would get mentioned, then never talked about again, so I felt like there were too many holes in his story. I was happy to be done with the book. If I take the time to read a book, you have to get my attention in the first chapter or two. Particularly in a Biography or Autobiography. I have many of them half read on the bookshelves. This is not one of them! I was so captivated after the first couple of paragraphs with the vivid descriptions and details I could imagine every scene as it played out. I couldn't put it down. Every extra minute I had, I went back to reading and two times late into the night to early morning. You will experience a range of emotions throughout the book, but regardless of whether you have had direct or indirect experience with addiction or not, you must read this. I can't wait for the movie!